Don’t be afraid little bud. Death is the greatest blooming. The most profound of awakenings. It is journeying through Mictlan. Shedding every last bit of carbon until you’re as pure and slick as the day you were born. Shimmering and smooth as obsidian, dark and reflective as the night sky and just as endless and eternal. 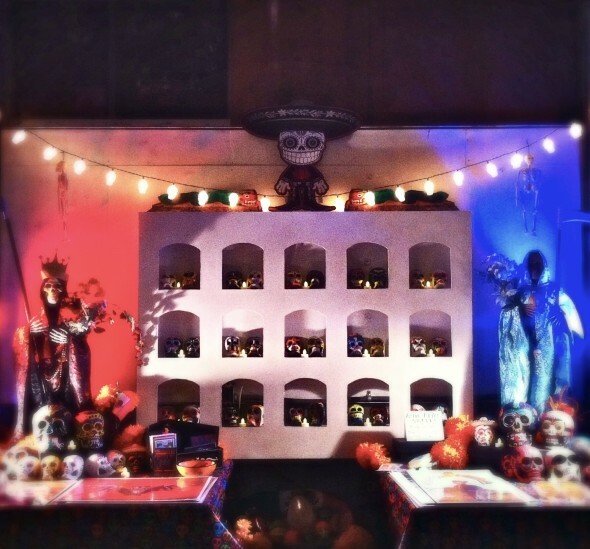 The ofrenda at the IAO and Film Row October Premier was built by Alicia Smith and was on display at Odd Fab Design Lab. 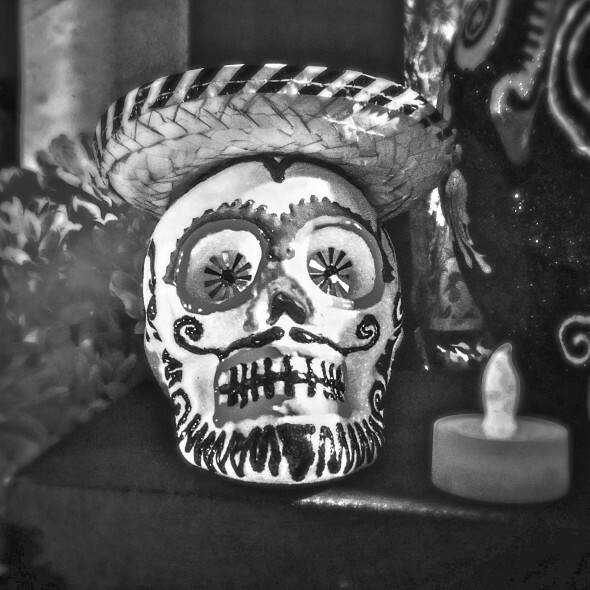 It was also used by HASA at OU for their 2nd Annual Day of the Dead celebration. In this way you could call upon your ancestors for guidance and they could you in turn. There was singing and dancing to help lead the spirits back to their loved ones. People covered their bodies in ash and wore bones. A Xocotl pole was erected and bloodletting was performed. A mock battle was staged in front of the temple of the sun. People from every class came to throw marigold blooms at each other. Delicate petals bursting from their buds. Europeans spread like the pox in Aztlan. The feverish conquest lasted 2 years. The Spanish were victorious. They were quick to destroy the temples as churches erupted like pustules on an already blighted landscape. The children were taken by the priests and forced into Catholic schools. Some adults, or those found “irredeemable,” were enslaved. The church allocated how many Indios would be put in the “care of” each conquistador. Their hair, which was believed to keep part of their souls intact, were cut. If they were caught speaking their native tongue, they were beaten. Women were raped, creating “metis” or “mestizos,” in an attempt to dilute the indigenous blood of later generations. They had very nearly eradicated our philosophy, knowledge and customs. Until All Saints and All Souls Day had been taught to them. And how appropriate to honor the dead in the ancient way and on the day when the blessed who weren’t canonized are to be honored? And following that, a day to honor all faithful people? Fray Diego Duran was aghast when he found the Indians making offerings in the cemetery on All Saints day. “I was told this was in honor of the children. I inquired whether offerings were also made on the Day of the Faithful Departed and the answer was ‘Yes, in honor of the adults. '” How heroic that in spite of their world shattering around their trembling skin, in the wake of conquest and severed souls, the Aztecs held fast to tradition. Tall and strong as a Xocotl pole. And just like that, the scabs fell off. A scar is a veil. Opalescent memory. If Dia De Los Muertos were flesh, it would look like Xipe Totec. True to its roots; the skin of the enemy is draped over tradition. Today in Mexico marigolds are brought to the cemetery, copal is still burnt, filling the air with the sweet smokiness of a juniper-like scent. 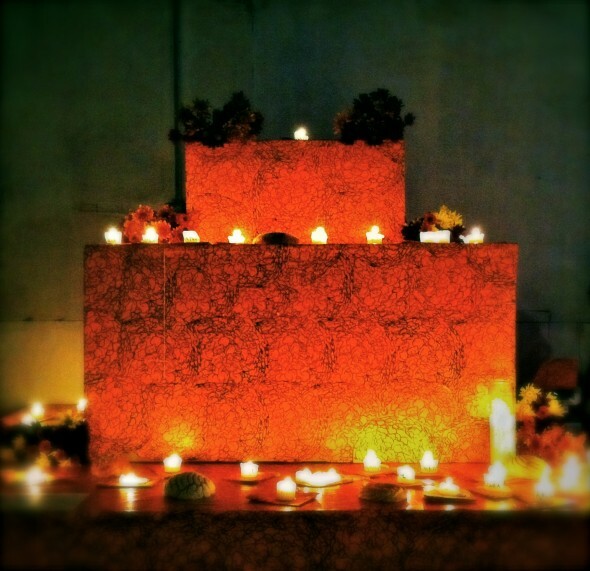 Ofrendas or altars are built in honor of the dead and dressed in photos, candles, food, and flowers. People paint their faces and wear skull masks. 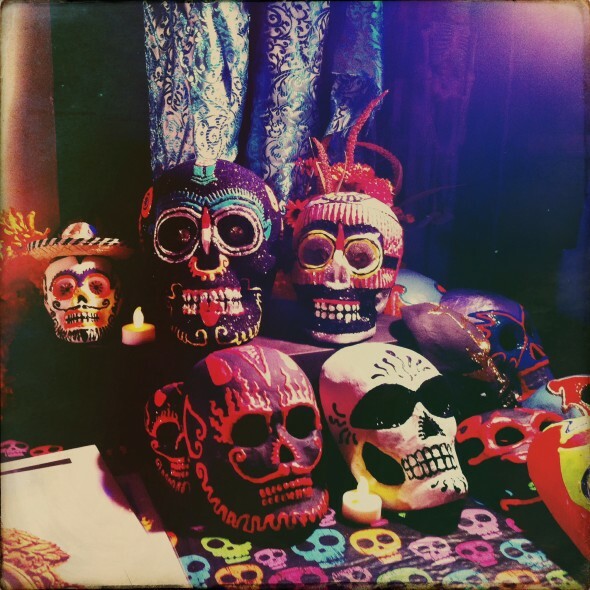 Calavera, Calacas, and Catrinas dance and sing and celebrate in the streets. In Guatemala they beckon souls with brightly colored kites. A flower must die before it releases seeds. We’re no different. Everything has “Inamic” a polar opposite. No matter the sickness the ritual still thrives. Strong as volcanic glass. Death is not an end, but a reflection of life. I heard a story this week about a Honduran man trying to get over the border to find work so he could send money back to his sister, who was ill.
That’s how all the stories seem to start. He heard about this woman who was a coyote, who would help people like him cross into the states. When he and his brother went to her, they were beaten and put in handcuffs. They were kept in a holding cell with many other people and forced to give phone numbers to family in the states to pay their ransom. During their transport to another holding place, a pregnant woman, fell and sprained her ankle. One of the accomplices to their ransom and kidnapping attempted to help her. OKC: Plaza Mayor has an event for 2014. Tulsa has a massive Dia De Los Muertos Arts Festival. 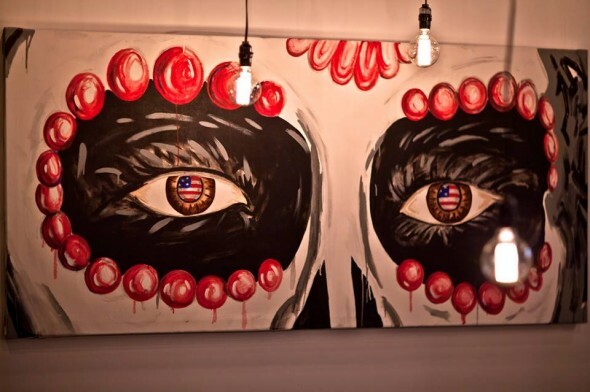 Tagged 2014, Alicia Smith, Annual Dia, chile, class, Dia De Los Muertos, festival, Film October Premier, Film Row October Premier, Fray Diego Duran, Fray Diego Duran Europeans, Friday, jokes, Mexico, norman, Octavio Paz, Odd Fab Design Lab, OKC, Retaurant Casa, Tulsa, Xipe Totec. Bookmark the permalink.